We can't be without this small delight and the bees love it too! The small spike of fringed, pale salmon flowers possess a wonderful sweet fragrance with overtones of raspberry. Napoleon brought this seed back from Egypt for his Josephine. She was entranced and named it 'mignonette' or 'little darling.' E.A. Bowles wrote in 1914, 'I like to place mignonette in a cut glass bowl, it is so cool and fresh in its green and gold and a spangling of silver and a ruby here and there that brightens it at close quarters.' The variety ‘Machet’ was listed in an 1886 garden catalog, which described it as having “deliciously scented red flowers. Entirely distinct.” Sow outdoors in early spring. Starting Outdoors: Direct sow in early spring; fall to late winter zones 8-10. The small spikes of fringed, pale salmon flowers possess a wonderful sweet fragrance with overtones of raspberry, and attract bees, especially swarms of honeybees. Pinch tips back when plants reach about 6” tall to encourage branching and fullness. 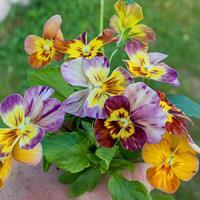 A fragrant cut flower for small bouquets or along the cottage garden edge or in pots. In cooler summer areas it will continue in bloom until fall, provide afternoon shade in hotter climes. Wear gloves when handling plants, as the foliage may cause skin irritation in some individuals. Fragrance maybe diminished if planted in heavy soils. It is normal for the plant to flop a bit before reaching maturity; it will correct itself as it grows. Watering Details: About 1" per week; do not overwater. Fertilizer: Mix about 2-4" of compost into soil prior to planting if soil is not rich. Feed monthly with a balanced organic fertilizer. Flowering: Racemes of delicate, pale-salmon colored flowers have a pleasant, spicy-sweet fragrance. Seeds: Flowers will turn into capsules containing the very tiny seeds. The Latin meaning of Reseda is to calm or appease.